Call me crazy, but I love....I mean loove themed parties! Just the thought of dreaming up decor, food and activities around a fun theme is enough to keep my brain swirling for hours. So when our Just Married's Small Group decided to do a Board Game Night for our first social, I was all over that junk like white on rice. I couldn't help myself! My focal point for the snack bar wound up being cupcakes. If you've know me for more than five minutes, this is not a surprise to you. In fact, I'm seriously contemplating petitioning to have cupcakes become an official food group. That way at least i'll feel better about myself when i'm eating them for breakfast. 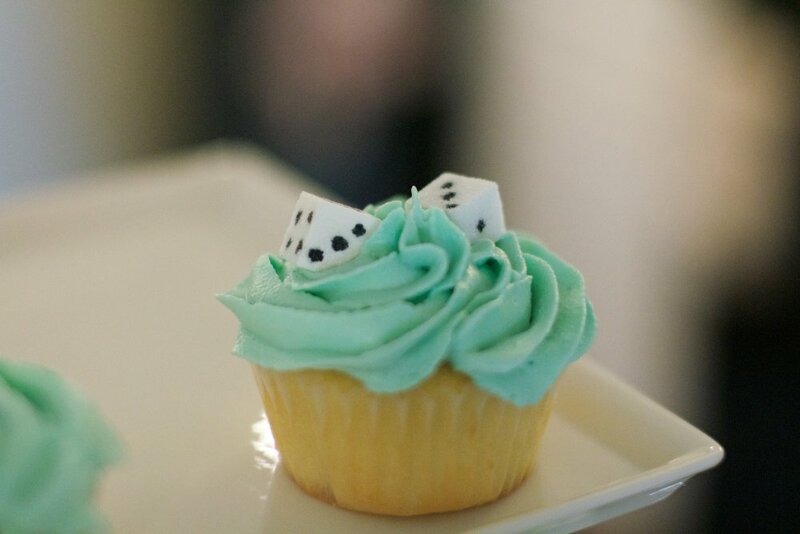 Anywho, I digress...let me tell you about the easiest theme-related dessert you'll ever make: dice cupcakes! I originally saw the idea on Pinterest where someone had made some adorable fondant dice for cupcake toppers. So cute, but let's be honest...ain't nobody got time for that. So I figured out a faster, cheaper option...sugar cubes! 2. Buy these cheap and easy sugar cubes at any local grocery store. 3. Find an edible ink pen for the numbers on the dice (I found mine at Michael's Arts & Crafts). I used these Wilton Edible Ink Pens, they worked great! 4. Display them in a fun way...because let's be honest, it's all about the presentation. 5. Game on. Eat as many as you can without them going straight to your hips. Life is always sweeter when there are cupcakes involved. Enjoy!